Obama’s campaign ads dismissively compare Romney’s work at Bain to that of a “vampire” draining jobs and money from vulnerable companies and workers. Afterpushbackfrom a handful of pro-free market Democrats in late May, the President himself publicly defended his campaign’s attacks on private equity firms like Bain. But records from Obama’s time as a state senator in Illinois, alongwith recollections of those who worked with him, present a very different stance. They indicate that Obama worked hard to position himself as a strong supporter of the venturecapital industry. Obama attended industry social functions and used hisposition in the state senate to propose bills consistentwith the legislative goals of the venture capital industry in the state. “The Barack Obama I knew in Springfield was very pro-private equity,private capital, and high technology” Republican State Senator Kirk Dillard, who servedwith Obama in the Illinois State Senate, said in a telephoneinterview with Breitbart News about Obama’s record last week. “Mr. Obama clearly had many friends in the private equitybusiness when he was a legislator,” Dillard added. Maura O’Hara, the Executive Director of the Illinois Venture Capitalist Association,concurred with Dillard’s assessment: “When he was in the State Senate I would describe him as a supporter of our industry.” She recallsmeeting Obama in 2002 at the IVCA’s annual award dinner. That year, theIVCA’s lifetime achievement award for “service to the privateequity/venture capitalcommunity” was given to Jack Levin of Kirkland & EllisLaw Firm. 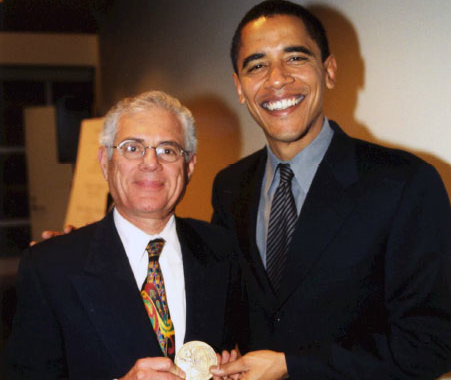 State Senator Obama was asked to deliver the award becauseboth he and Mr. Levin had attended Harvard Law School, albeit severaldecades apart. A photo from the event shows Obama grinning as he standswith his arm around Mr.Levin. Both men hold the award up between them. Obama’s effort to show support for private equity went beyond socializing. Between2001 and 2003, State Senator Obama introduced two bills and one resolutiondesigned to boost the private equity business in Illinois. The first bill,introduced by Obama in early 2001, created a tax credit of up to 20 percent for anyone who invested in aby the full Senate. The following year, Obama introduced a bill titled the “Venture Investment Fund-Repeal.” The bill itself is somewhat cryptic,but its purpose was to repeal the “Illinois Venture Investment Fund.” (Ironically, this was a public venture capital fund similar to the Department of Energy program under Obama that funded Solyndra, the failed solar panel company which hasdogged Obama’s campaign for nearly a year.) At the time Obama introducedthe bill, the Illinois Venture CapitalAssociation had issued a legislative position paperwhich made four recommendations. Point one was the elimination ofpublic venture capital managed by bureaucrats rather than professionals. According to the position paper, “The role of Illinois’government is to create a positive investment and entrepreneurialenvironment, but not to attempt to manage these funds [emphasis added].” The IVCA recommended investing the public money with private equity funds instead (i.e. with its members).Obama’s attempt to repeal the public venture funds died in committee,though the fund was eliminated in a consolidation move by the Illinois GeneralAssembly about a year later. Of course, not every investment is going to work out, but Obama’s 2002 resolution specifically stated that private equity is “the best opportunity forlong-term economic vitality…and for providing the greatest number of citizens with genuineopportunity.” In other words, it is the best thing for communities and workers. The message that Obama’s prospective campaign donors received was that Obama was no longer positioning himself as the political reformer who would shake up Chicago and Washington–and that there was little daylight in between his own attitude towards private equity and the likely approach of rival Blair Hull. This bill forms a Private Equity Task Force. As many of you know,venture capital and private equity is one of the key mechanisms by whichwe finance new businesses in the State of Illinois. For a variety ofreasons, Illinois has been lagging behind some of our competitor statesin the formation of venture capital and its deployment in terms ofseeding and funding new companies. This is an issue which has peaked [sic] theinterest of various persons in the industry and so they have asked thatwe form this Private Equity Task Force to examine these issues. A story published Saturday by the New York Times notes that “Obama commercials painting [Romney] as a ruthless executive who pursuedprofits at the expense of jobs are starting to make an impact on someundecided voters.” The mainstream media has coordinated its attacks with the Obama campaign, though many of those attacks, including a Washington Post investigation into outsourcing at Bain, have been debunked. Given Obama’s record in Illinois, it is fair to askwhen his own effusive admiration for private equity equity flip-flopped into hiscurrent disdain for “vampire” capitalism. When did he stop believingthat private equity was the best chance for creating economic vitality,jobs, and genuine opportunity? And did he ever, in fact, believe it?